An initial reaction to the 2014 General Election results from Ian Anderson (Fightback). More analysis to come. This election was a disaster for the left. Apparently a landslide victory for National, non-votes again matched National votes, underlining the lack of a convincing alternative. Labour and the Greens lost votes. The biggest tragedy was Internet MANA’s failure to win any seats as a fighting opposition. Internet MANA was an electoral alliance, designed in part to engage tau iwi and widen the party vote for MANA’s project of rangatiratanga for te pani me te rawakore (formed through betrayals by successive Labour and National governments). However the electoral campaign was fought and lost not in the party vote campaign, but in MANA’s home turf, Hone’s electorate of Taitokerau. The establishment parties combined forces to kick Hone out of parliament. Labour chose to run a hard campaign in Taitokerau – happily backed by the Nats, New Zealand First, the Maori Party. This was the culmination of a generalised establishment smear campaign against Internet Mana and everyone associated with it. The ‘Mood of the Boardroom’ was that Harawira and Harre are “dangerous radicals,” which as ISO’s Andrew Tait observed, is an endorsement from a socialist perspective. Just as in the Scottish referendum, the boardroom-aligned parties combined to strike fear and terror into voters about the dangers of an alternative which threatened their power. However, the association with Dotcom was also discrediting for legitimate reasons. Dotcom is a profiteer and a misogynist, a man who pays his Filipino workers less than the minimum wage. For any tactical advantages the ‘sugar hit’ seemingly offered, it also sent signals that MANA was engaging in the same old dirty politics. On election night, Dotcom apologised for the impact of his association on MANA. Those of us who seek to forge a transformative movement of the people have a lot of reflection to do, and a lot of work to do. It was never just about winning seats, and many who hoped for better results knew that perfectly well. Liberation was never going to come through a higher vote, but rather through a combined struggle in every sector. 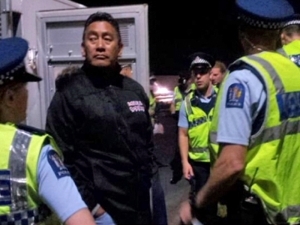 On election day the movement lost a fighter in parliament, but as the only MP arrested fighting for public housing, his mana does not depend on a seat.